A simple 4 light spotlight bar from the Amalfi range finished in gloss white. Fully adjustable so light can be directed exactly where you need it. Suitable for commercial and domestic use. Stylish ceiling spotlight bar finished in gloss white with a central circular ceiling mount and twin lamp support arms, each holding two fully directional chrome lamp heads. This simple spotlight bar can be installed in a straight line as shown in the main image or can be set at various angles thanks to the independent lamp support arms, making it a great choice for regular or irregular shaped rooms. 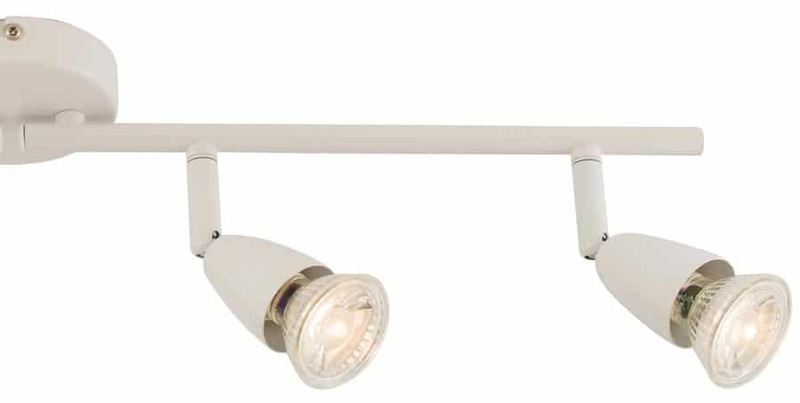 Other products in the gloss white Amalfi spot-light range can be viewed below and include six, three, two and single lamp spotlight fittings. The range is also available in polished chrome, antique brass and satin nickel finishes.